Home / Study / Discover Sunderland / Education and Society / What's not to love about studying English? What do you teach and what is your academic background? "I’m a former Sunderland student: Bachelors, Masters and PhD. I had a place to study at another university as an undergraduate, and was accepted for a PhD elsewhere, but Sunderland was the fit for me, in terms of courses, resources and expertise. 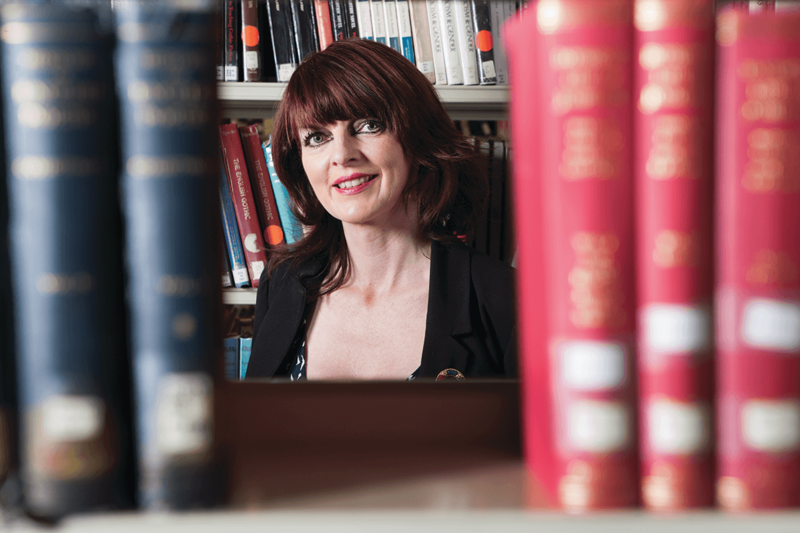 "I have quite a broad teaching portfolio which, like all of the modules in the English Scheme, relates to research. At Stage Two, I teach Renaissance Literature, Contemporary Irish Drama, and the ‘Criticality’ side of Creative Writing and Critical Thinking. At Stage Three, I teach Chaucer and Shakespeare (beloved of our Education students), Contemporary Irish Poetry and Modern Gothic. At postgraduate level, I teach Gothic, Late Victorian Gothic and the Irish Fantastic. It’s a diverse range of modules, but only a tiny part of what students get the chance to study at Sunderland. 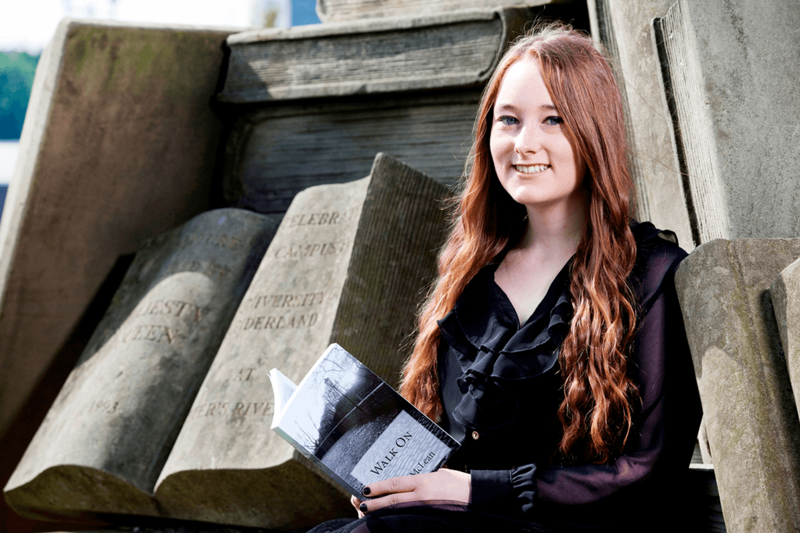 I specialise in Irish Studies (more broadly ‘Celtic Studies) and Gothic, and you can see that I have the opportunity to teach my specialisms more as the years progress." "I am passionate about my subject area - I’ve won a number of SLTAs (Student-led Teaching Awards) for ‘most passionate lecturer’. So, where do I start? English, for me, encapsulates all aspects of culture. It teaches us context, concept, and a love of language which encourages us to read into texts, and beyond them. It teaches us about history, politics, class, countries and times other than our own. We learn to read for allusion and metaphor, and we learn how to think critically, and this changes us. Above all, we are encouraged to read, interpret and respond. It’s exactly what people were being asked to do in the earliest universities. What’s not to love about that?" "Students really are getting cutting-edge research." What kinds of careers can students look forward to after graduating in English? "We have a tremendous progression rate from undergraduate through to postgraduate (PGCE, PCET, MA and PhD). Many of our students go on to become teachers (from primary to postgraduate levels), we also have students who have become researchers, editors, political aides, speech writers, proof-readers, editors, and journalists. Some students have used their linguistic and rhetorical skills to progress on to Law Conversion courses and have become solicitors and senior civil servants. English is about written and spoken communication, so the field is wide open to our graduates. We factor professional writing skills into our provision, so our students are, in many ways, ahead of the field in this respect. "Another thing we factor in is employability skills. We are very aware of how competitive the employment marketplace is, and we know it is hard for students to get gainful graduate-level employment without experience. With this in mind, we have created modules (including Spectral Visions Press) which give students hands-on experience of running a press. There are numerous associated skills with this: events management, conference organisation, marketing, and so forth. We know that some of our graduates have used this experience to achieve the job they always hoped for. Their CV says they have the experience, and so they are more likely to be interviewed. When they get to the interview, they have more confidence. It’s a circular procedure." "We have an excellent provision in the English Scheme, based around three strands of Literature, Linguistics, and Creative Writing. This allows students to study (from a literary perspective) Historical modules (such as Medieval, Renaissance, Romantic Literature), Literatures in English (Arab, American, African and Irish Literature in translation, to name a few), and specialist modules such as Gothic, and Women’s Autobiography. In Linguistics, they get to do everything from Language Acquisition, through Gender and Language, Discourse Analysis, Stylistic Analysis, and Cognitive Poetics. Creative Writing covers all genres and allows students the ‘value-added’ of working in a press, poetry slams, readings, book launches, and so on. Our team are all internationally-recognised academics and writers, so students really are getting cutting-edge research. We have a spine of Critical Theory going through our degrees so students gain a concrete base for the study of English Literature, Language and Creative Writing while we have enough flexibility to give them the opportunity to specialise. At the core of what we do is to encourage students to discover new approaches and to develop their own responses." Our team are all renowned academics and writers, so students really are getting cutting-edge research. We have a spine of Critical Theory going through our degrees so students gain a concrete base for the study of English Literature, Language and Creative Writing while we have enough flexibility to give them the opportunity to specialise. At the core of what we do is encourage students to discover new approaches and to develop their own responses." "We give our students that most important thing: time." What kind of opportunities are there for students whilst they are studying? "Besides the obvious academic opportunities, and the opportunities I’ve already mentioned, we have a tremendous support network at Sunderland – from the library to disability services. To summarise: students have the chance to study with world-leading academics, in a pleasant and student-friendly environment. They are given the opportunity to engage in extra-curricular activities, such as conference and competitions, and they are encouraged to publish, blog and generally have a fabulous, but hugely edifying time." "We’re a small but dedicated team of published and passionate lecturers. Our formal teaching is complemented by programmes of research lectures, readings, and symposia. Students get to know us, and this gives them a sense of cohort and institutional identity. Our programmes are exciting, dynamic, and developed with our students in mind, and we give our students that most important thing: time." Probably just had the best English Literature seminar today :) @sunderlanduni definitely has the best lecturers ever! "The best resource they have (across the board) is impassioned and committed lecturers, but, beyond this, they have a range of services which is second-to-none, state-of-the-art facilities, and a tremendous Students’ Union; and all of this in a dynamic and developing city which is on the rise." "Just do it! It is life-changing! You’ll be a changed person at the end of your degree, and you’ll have highly sought-after skills for employers. Who knows, you could even be the next J.K Rowling!"